Rachel and I want to let you know how much we appreciate you and enjoy coming to your office! We have had such a great experience at your office in every way. Rachel and I both agreed after consulting with Dr. DeVito that we were the most comfortable at this office compared to the other offices we visited. Rachel’s teeth are coming along as we expected and of course, she is looking forward to seeing the final results! I really liked the way Dr. DeVito was straight up about our treatment options and care. Rachel and I are both very happy with your office. 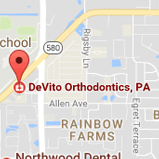 I was referred to Dr. DeVito by my dentist. In my consultation with Dr. DeVito, he addressed all my concerns about starting treatment in my 40s. Now two years later, my braces are off and I am amazed and so pleased with my new smile. Not only do I love the care I receive at Dr. DeVito’s office from the bottom to the top of the hierarchy. This website is awesome! I wish every doctor I have had the foresight to understand that a little initial investment to make life easier for patients is an investment that will pay off not just in cost effectiveness in the long run, but in patient satisfaction presently and in the future: Looking up appointments, checking balances, even being able to see images. I’m so impressed! My dentist sure sent me to the right place! I had the privilege of meeting Dr. DeVito and his staff almost seven years ago when my family moved to Florida. Having worked for an orthodontist in Michigan, I was very picky about who would finish my oldest son’s treatment and begin my youngest son’s “phase II” treatment when necessary. Dr. D and his staff are always professional; however, they make it such a friendly atmosphere you feel like part of the office family. Even with all my questions and concerns, I always felt Dr. DeVito was honest and fair at all times. Both of my sons had, let’s just say, “difficult” cases and Dr. D finished both with extreme care and precision as if he were working on his own children. I very much appreciate our place in the Dr. D office family. Thank you cannot express my sincere gratitude! We would like to take this opportunity to tell you all how pleased we have been with the care our family has received from your orthodontic practice. 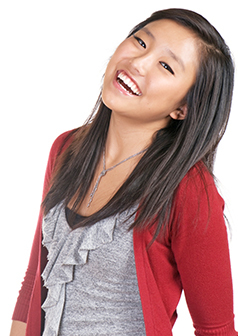 DeVito Orthodontics has far exceeded our expectations in every way! Both our children and us as parents look forward to each visit because of the quality care and attention we receive. Our children’s beautiful smiles are an added bonus! 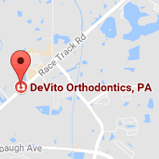 DeVito Orthodontics is everything we were looking for and more! Our visits are always pleasant. From the warm reception to the compassionate, patient, quality care that is given by Dr. DeVito and his staff. You are ALL our favorite! We are so grateful to have found you!! I had been debating whether or not to meet Dr. DeVito for a while when a friend recommended I go into the office for a consultation. I was a bit unsure how I would feel at 28 years old wearing braces. Dr. D. put me immediately at ease. He answered all my questions and made recommendations as if he were a personal friend of mine. I’ve been wearing my braces for almost a year now, and his care and concern for my well-being is comforting and appreciated. It’s a pleasure to walk in and see Koren and Lori Sue’s smiling faces. Cindy, Abbey, and Karen are courteous and pleasant and I look forward to visiting the office. Thank you to Dr. DeVito and the entire staff for making sure that an otherwise undesirable experience is cozy and delightful. I am thrilled to have the opportunity to write this letter of recommendation for Dr. DeVito and Staff. I went to many orthodontists in the Tampa Bay Area and even upstate New York to get their opinion. I had a Class 2 overbite and many spaces between the bottom teeth and upper teeth along with some bonding. At the age of 32 and being in sales, I did not feel comfortable wearing braces so I continued on with my search for that talented orthodontist and I finally met Dr. DeVito. Dr. DeVito explained how Invisalign® works and showed me images of how my teeth will look after the process through the Invisalign 3D imaging software. I was so excited and started Invisalign the following week. Dr. DeVito is extremely talented, honest, and works with great attention to detail. He worked with me every step of the way and every time he was ready to work on my teeth he would explain what he was about to do so I knew what to expect. And now I am excited to say that one year and five months later I have completed the Invisalign treatment thanks to Dr. DeVito and his staff. My teeth are straight, spaces and gaps are gone along with the bonding that was hiding the biggest gap between my upper teeth. My expectations have been exceeded! My teeth now look like something you would see in a magazine. I feel like a movie start and I am a living proof of Dr. DeVito’s hard work and dedication. The office staff was always very nice and accommodating to my busy traveling schedule.